Download the entire book COMPLETELY FREE! This unique book presents an approach to learning scales using other scales or arpeggios you already know. The idea for it was sparked by a simple question: how many different 7-note scales can I learn by adding two notes to the familiar Common Pentatonic fingerings? The answer led to the realisation that this is a powerful way to find the fingerings of new "exotic" scales. In the books terminology, this is the 7-spectrum of the Common Pentatonic. Of course, the idea can be generalised to any scale or arpeggio, and a spectrum of any size. For example, the 5-spectrum of the minor 7 arpeggio tells you all the pentatonic scales that include that arpeggio. These can be learned simply by adding one new note -- a very easy process. If you need to memorise (or just want to experiment with) a large number of scales, this approach is very fruitful. 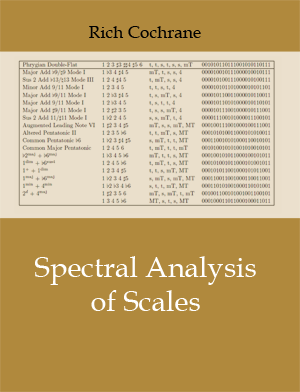 Spectra of Scales is mostly a reference book. The first chapter gives a careful explanation of the theory behind the construction of spectra. The remaining chapters give 3- to 8-spectra of 3- to 8-note scales. It's suitable for players of all instruments, and works well alongside Arpeggio and Scale Resources. It may also be of interest to composers seeking new ideas for working with scales and pitch class sets. Download the free PDF now.